If you are a weapons fan, this Mauser has a nice laminate stock and almost no blueing left. Neat. 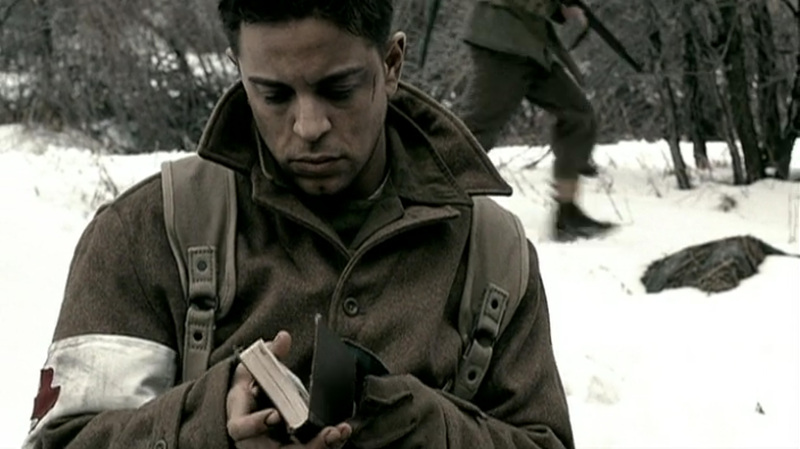 Saints and Soldiers (2003), directed by Ryan Little, was an enjoyable film that carried with it some minor groan-worthy plot devices and major historical inaccuracies, but engages the viewer and delivers a good tale of bravery and duty. 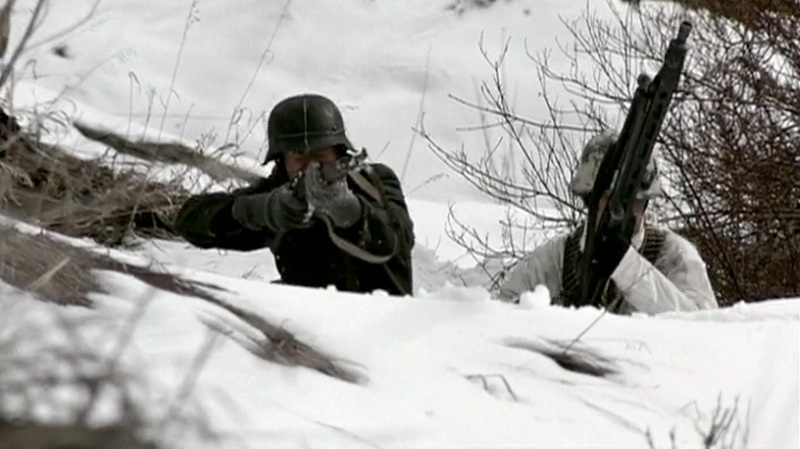 Set during the very cold winter of 1944, the film depicts the Malmedy Massacre near Malmedy, Belgium, during the Battle of the Bulge. Here Germans of the 1st Panzer Division murdered 84 American prisoners of war and left them in the elements. Our crew at rest, except for Deacon, who is on watch. Our story opens with the aftermath of the massacre, and then fills us in with tale of several men who escaped into the woods. These men, of different units, then proceed to hide out, get to know each other, and form a bond. 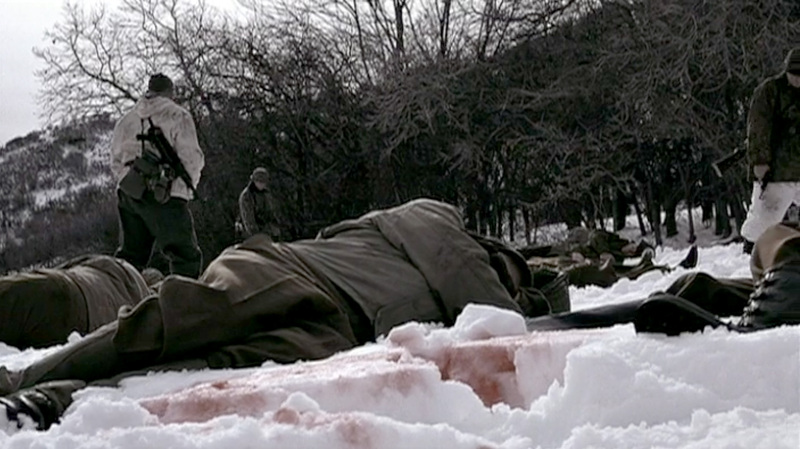 In the process, they encounter a downed British pilot hanging from his parachute harness. This fellow, Flt. Sgt. Oberon Winley, is a rather off-putting chap who claims to have vital intelligence that is critical to the war effort. 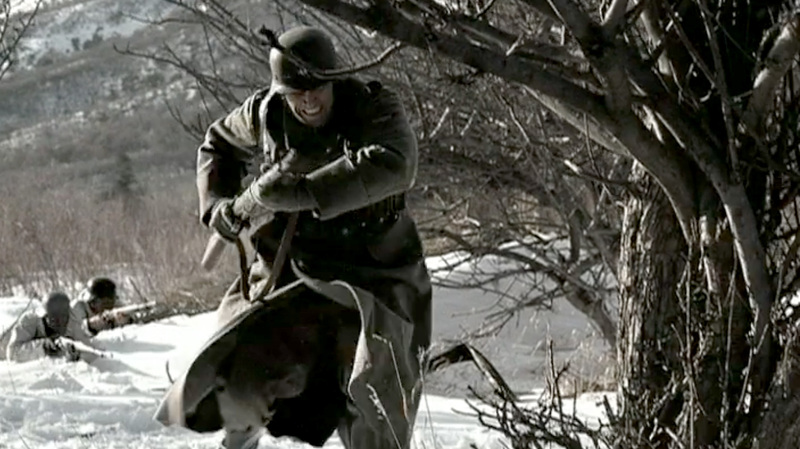 He convinces the Americans to help him find a command post of some sort in order to deliver his vital intel, but the men are all behind enemy lines and 60 miles from the nearest Allied presence. 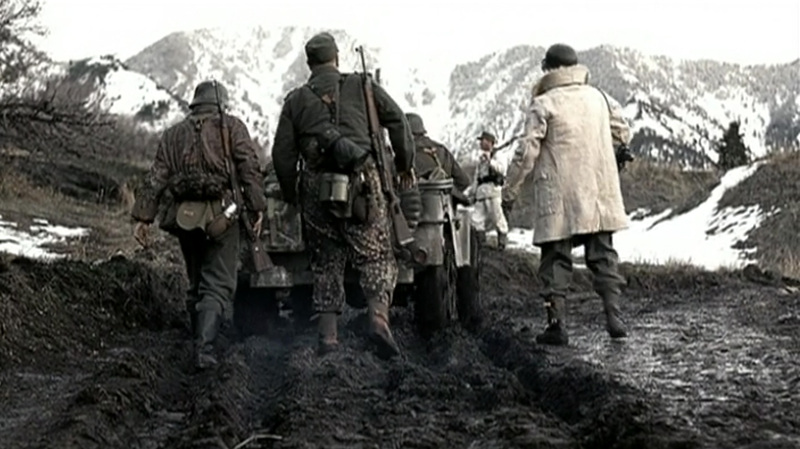 Despite the weather and lack of adequate weapons, the group sets out. To avoid spoilers, I’ll leave it at that. This film seeks to bring the spiritual and the afterlife into the story. The main character is Cpl. Nathan ‘Deacon’ Greer. His nick-name reflects that he’s a non-drinking, non-smoking, good boy of character. I should have picked up on the fact that he was a Mormon when the film made the point he did not even drink coffee, as this is a Mormon conviction. Indeed this is a film made by Mormons. While I am a Christian and cannot do anything but warn against Mormonism, outwardly speaking, Mormon theology is a moralistic, works-based system. That translates to these folks making nice neighbors, good employers, and yes, clean film makers. There is little if any profanity in this film, and that is a nice break from the norm. 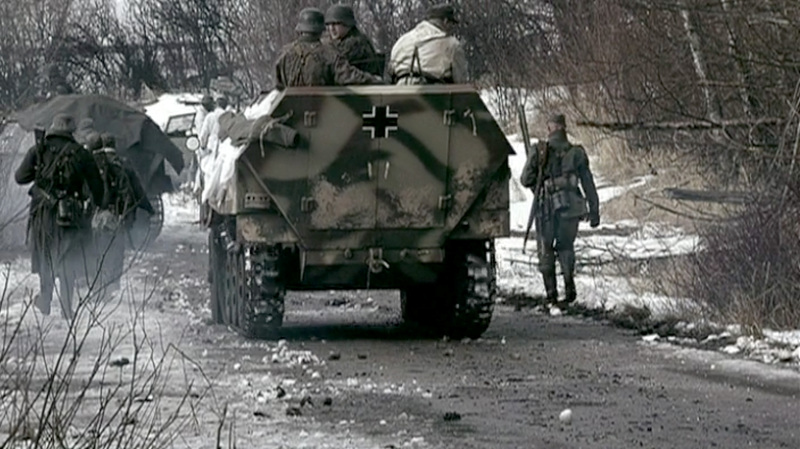 There were some nice vintage vehicles in the film, and according to IMDB, re-enactors volunteered to be in the movie. I would expect the vehicles were from various collector societies. They lent a great touch of realism. The spiritual element is kept generic. If you read the reviews, it was intentionally generic, supposedly to attract a wider audience, especially of Christians. Deacon indeed has some witty and mildly thought provoking lines about the afterlife, but if one does not know this is a Mormon film, it could pass for any sort of modern pop-spirituality. This means the message, in my opinion, is amazingly ineffective and weak. It leaves the viewer with no real answers to the dilemmas faced by men who are taunting death daily. Still, the story is a good example of an adventurous trek by a likable and duty-bound company of underdogs, who, in the end, turn out to be quite heroic. You will have to suspend your historical nit-pickings about units and roles though. The production value is quite good for the budget, and the acting did not cause me any alarm, it was often times quite good. 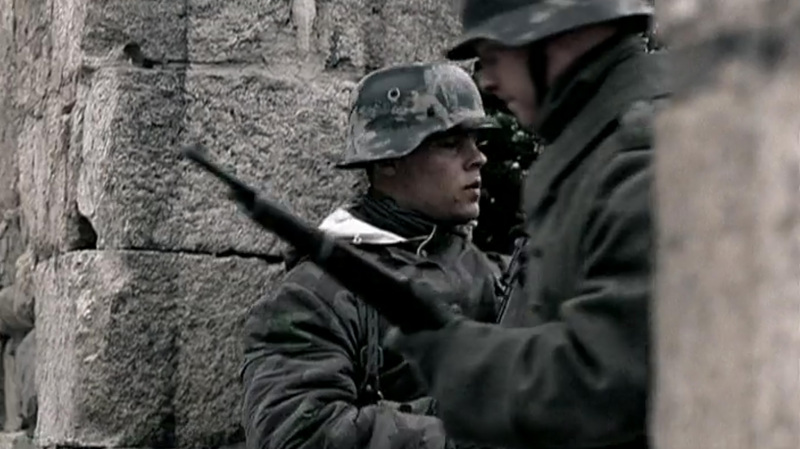 I can recommend this film as an adventure and to give a decent look at the harrows of war. There is a lot of death in the movie, but death is real. My 8 year old watched it with me and was powerfully moved by the implications of dying, so it does have use. I give it a B+. And I am wavering on giving it more because of the conversations it stirred in my house. Worth a watch.